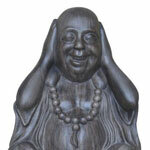 Based around the famous Japanese proverb this Buddha moulding is highly realistic and very hard wearing. Make great gifts for friends and family or simply just to brighten up your own home. Simple to maintain with its smooth, tough finish. Unaffected by the UK weather when used outdoors. Moulded from tough polymer fiberglass it’s lightweight and really hard wearing. We also sell see and speak no evil ornaments as well.